I'll be picking some Old-Time Country Blues up north in Wisconsin. I'll be playing some old-style Country Blues, Ragtime and Bottleneck Slide amidst the aroma of some of the finest barbeque in the city. I'll be playing a couple of wake-up sets at the best place to get a wake-up cup and bag of beans. 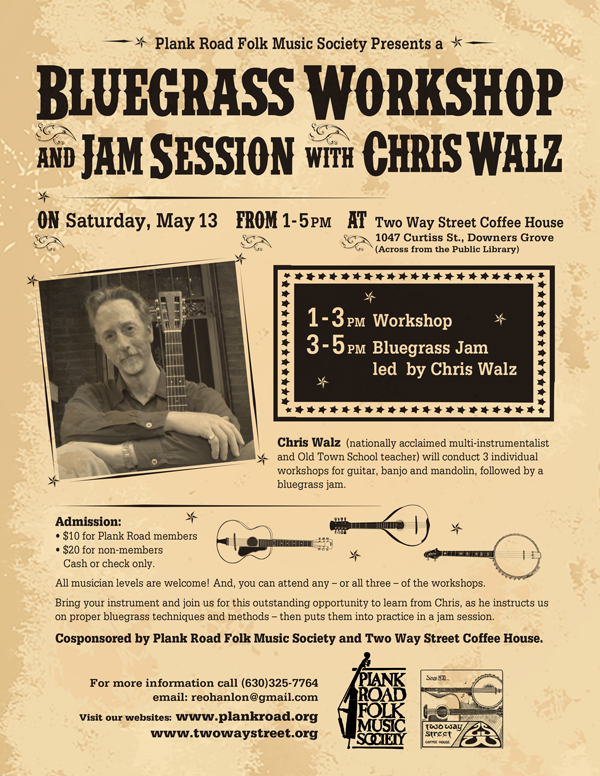 I’ll be sitting in on the Plank Road Bluegrass Jam ahead of a Guitar, Banjo and Mandolin workshop I'll be giving on May 13th. The Plank Road Bluegrass jam takes place at 2 PM at the Two Way Street coffeehouse on the fourth Saturday of the month. Banjos, Mandolins, Guitars – any acoustic instrument welcome! This monthly gathering is for Bluegrass musicians of all experience levels. Sing, play or just sit back and enjoy. Songbooks provided. Come out for a three-day gathering over the Independence Day Weekend at Stonehouse Farm to build community through bluegrass music, homesteading, fireworks, kids’ camp, a special Farm-to-Table dinner that celebrates American foods, and a shared connection to the land. Come on out to the Maple St. Chapel folk concert series and join me and my buddy Eric Lambert for a great night of flat picking, bluegrass, and original songs. Eric and I have known each other for a number of years now, but this is the first time we’ve gotten the chance to perform together. Here’s the link for all the tickets and information. And here's a little video our friend Melissa Dagenhart, of Maple Street put together for the show. Folk Festival is on from 8 to 11 p.m. central - enjoy the whole show! Join me for a couple of sets of Old Time Country Blues and Bluegrass Flatpicking. I'll be backing up my good friend, Mark Dvorak along with Steve Doyle Saturday night. Join me and Rita Ruby for some old time country and bluegrass. This historical, family festival is held on the Museums at Station Park campus from Noon - 5:00 PM on the second Saturday and Sunday each September. If you are looking for a fun, inexpensive family outing, bring your clan to Art on the Prairie and Afternoon Jazz Festival Saturday, Sept. 13 and Sunday, Sept. 14. Admission is free; hours are 10:00 a.m. - 5:00 p.m. both days. The festival is located in the Warrenville City Hall parking lot on Stafford Place. The event offers art, free music, free kids' activities, micro brew and wine tasting, and food. Join me and my good friend, Mark Dvorak for a house concert/fundraiser benefiting Feline Friends. I'll be on the balcony at Chicago Cut enjoying a beautiful Summer evening, while playing some good old Fingerstyle Blues and Ragtime.